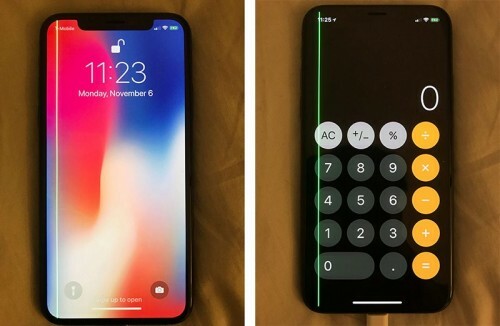 The recent issue has been reported by several iPhone X owners, the device’s screen shows green lines. The issue is reproducing on models of different color and with different storage options. So far there were about 25 cases with green lines on the display. This has been reported by users on different resources, including Apple Support communities, Reddit, Facebook, Twitter and MacRumors forum. The number of defective devices is growing, but still not statistically significant. The users who had the issue told that the screen was okay when their iPhone X was taken out of the box, it happened later after some time of regular usage. The devices have not been dropped or damaged in any way. Users encountered with the issue reported that neither restarting nor restoring the devices to factory settings fixed the issue. Most likely hardware defect caused the lines to appear. Apple spokesperson didn’t comment on the issue so far. Samsung faced the similar problem when OLED Samsung Galaxy S7 displayed pink lines on the screen. Samsung acknowledged the issue as a hardware bug and replaced the affected items for free. Owners of the affected iPhone X reported that Apple replaces the devices with the new ones free of charge. If you experience the same issue, make an appointment at Genius Bar or contact Apple in any other convenient way. Apple seems to be collecting more information so that the engineers can investigate the case.